Rice is believed to have been introduced to the "new world" around fifty years after the conquest. 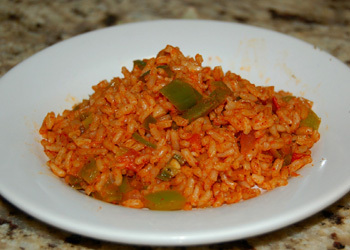 Today rice is found in various forms in traditional Mexican cuisine. Rice can be served as a dessert as in Arroz con Leche, or it is also served as a side dish, as in Mexican rice or Spanish rice, or in a combination entrée such as Arroz con Pollo. In our family, Arroz con Pollo could be counted on to serve a large group quickly and economically. Here is the family recipe that stretches one chicken to serve eight. Four ounces of pimento stuffed Spanish green olives. In a two quart pot make a stock (broth) from water, one onion, bay leaf, seasoned (salt and pepper to taste) chicken back, neck, giblets and wing tips. Simmer about twenty five minutes, allow liquid to reduce to six and one half cups liquid. Remove chicken, bay leaf and onion and set aside liquid. In a large pot or Dutch oven, brown seasoned (salt and pepper to taste) chicken pieces in oil. Drain oil and sauté garlic, bell pepper, tomatoes, and remaining onions, with chicken until vegetables are tender. Add Salt and pepper to taste. Add saffron. Be careful not to overcook, about 10 to 15 minutes. Add rice and stir into chicken and vegetable mixture until all the rice is moistened. Combine broth, beer and tomato sauce and simmer 3 to 5 minutes. Pour the eight cups liquid over chicken, rice and vegetable mixture and stir. Simmer for ten minutes. Add drained olives and carrots. Season with salt and pepper if needed. Cover for twenty minutes or until rice is cooked, stirring only once to keep from sticking.